By using ‘keytool’ command provided as part of java installation, you can generate self-signed certificate. Below command creates a self-signed certificate with validity of 365 days. Is CN=krishna, OU=krishna, O=krishna, L=krishna, ST=krishna, C=kr correct? Now you can able to see the ‘selfSigned.jks’ file. 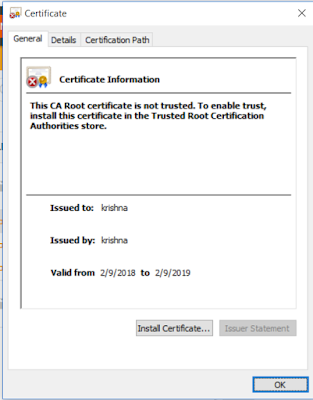 How to export the certificate from .jks file? for example, below command export the self signed certificate to the file ‘myCert.cer’. Once you open the certificate, you can able to see below kind of image.